Believe it or not. It was only a week ago that I got hooked on Gundam. I am still learning about this, so any mistakes please forgive me. 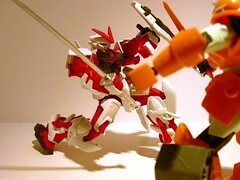 Gundam is a Japanese cartoon of "Mecha". In the cartoon each of these Mechas are driven by an individual. There are both good and bad ones, from different cartoon series. What I got hooked on are the models for this Mecha. There are basically three different grades of models available: High Grade, Master Grade and Perfect Grade. The latter being the highest grrade. The difference being the details of the model and the number of parts required to put together a complete model. Aside from grades there are also different scale models the most popular being the 1:144 and 1:100. I believe the Master Grade is only available in scale of 1:100 and above. I am fortunate to live in Hong Kong where these models are readily available and like most other things in Hong Kong, the stores are all concentrated in the same general area ("Mong Kok"). Of course there is always "Toys R Us", but then I later found out is the most expensive place in Hong Kong to get them.